A year ago this week, Joc Pederson was nearly a ghost in the National League Division series, left with little more than his ability to let pitches go by him. Pederson came to the plate eight times in the five-game 2015 NLDS, going 0 for 4 with four walks (one intentional). That followed a three-month descent in which the center fielder, a prime Rookie of the Year candidate from April to June, hit .170 with a .300 on-base percentage and .284 slugging percentage. His six home runs were chained down by 76 strikeouts. As recently as Spring Training, Pederson still seemed to be trying to figure out his stance, his approach, his just about everything. But as he became a fainter blip on the radar in comparison to this year’s rookie darling, Corey Seager, even as he even looked like old news compared with a sudden story like Andrew Toles, Pederson quietly turned in a quality 2016 from start to finish — a .352 on-base percentage and .495 slugging percentage. Though he still played rarely and ineffectively against left-handed pitching, Pederson’s 129 OPS+ was second on the Dodgers to Seager, ahead of even the likes of Justin Turner. In September, Pederson OBPed .430 and slugged .651 with a team-high seven homers. And then, as Seager’s initial outburst (two homers and a double) in this year’s NLDS dissolved into an 0-for-13 finish, it was old man Pederson — a wizened 24 by now — who stepped and ultimately, kick-started the rally that sent the Dodgers to the National League Championship Series. 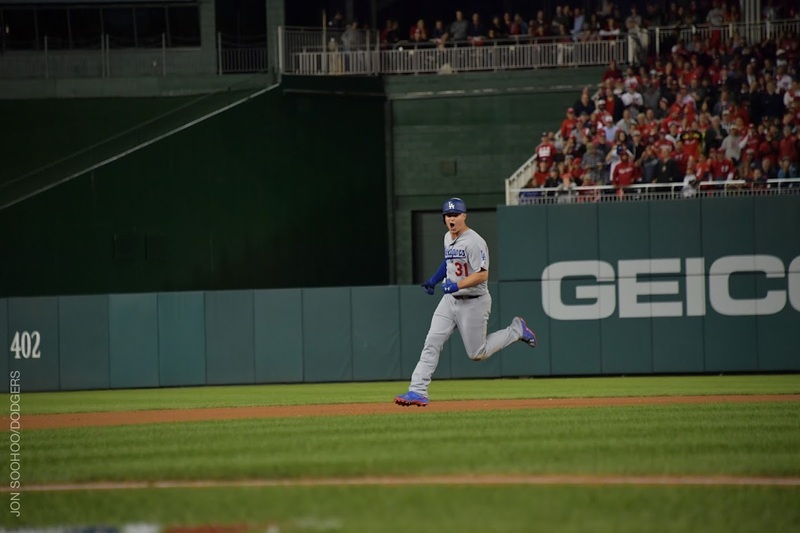 Pederson’s opposite-field homer on the first pitch of the seventh inning ended Max Scherzer’s shutout, tied the game, delivered the Washington ace to the showers and ignited the Dodgers’ four-run rally that relievers Kenley Jansen and Clayton Kershaw would ultimately make stand.